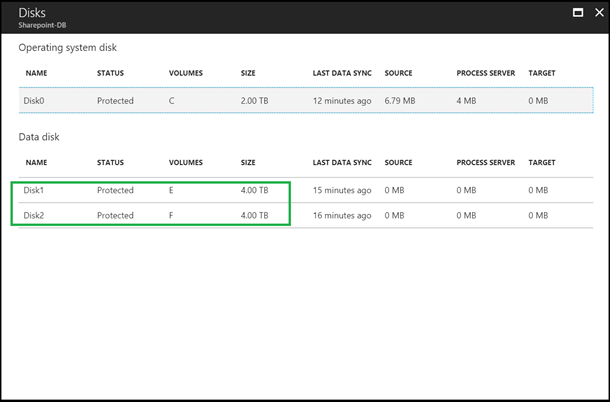 Following the recent general availability of large disk sizes in Azure, we are excited to announce that Azure Site Recovery (ASR) now supports the disaster recovery and migration of on-premises virtual machines and physical servers with disk sizes of up to 4095 GB to Azure. Many on-premises virtual machines that are part of the Database tier and file servers use disks with sizes greater than 1 TB. Support for protecting these virtual machines with large disk sizes has consistently featured as a top ask from both our customers and partners. With this enhancement, ASR now provides you the ability to recover or migrate these workloads to Azure. These large disk sizes are available on both standard and premium storage. In standard storage, two new disk sizes, S40 (2TB) and S50 (4TB) are available for managed and unmanaged disks. For workloads that consistently require high IOPS and throughput, two new disk sizes, P40 (2TB) and P50 (4TB) are available in premium storage, again for both managed and unmanaged disks. Depending upon your application requirements, you can choose to replicate your virtual machines to standard or premium storage with ASR. More details on the configuration, region availability and pricing of large disks is available in this storage documentation. To show you how Azure Site Recovery supports large disk sizes, I protected the Database tier VM of a SharePoint farm. You can see that this VM has data disks which are greater than 1 TB. Before you start protecting virtual machines/physical servers with greater than 1 TB disks, you need to install the latest update on your existing on-premises ASR infrastructure. This is a mandatory step for existing ASR users. For VMware environments/physical servers, install the latest update on the Configuration server, additional process servers, additional master target servers and agents. For Hyper-V environments managed by System Center VMM, install the latest Microsoft Azure Site Recovery Provider update on the on-premises VMM server. For Hyper-V environments not managed by System Center VMM, install the latest Microsoft Azure Site Recovery Provider on each node of the Hyper-V servers that are registered with Azure Site Recovery. I would like to call out that support for Disaster Recovery of IaaS machines in Azure with large disk sizes is not available currently. This support would be made available soon. Start using Azure Site Recovery today. Visit the Azure Site Recovery forum on MSDN for additional information and to engage with other customers. You can also use the ASR User Voice to let us know what features you want us to enable next.